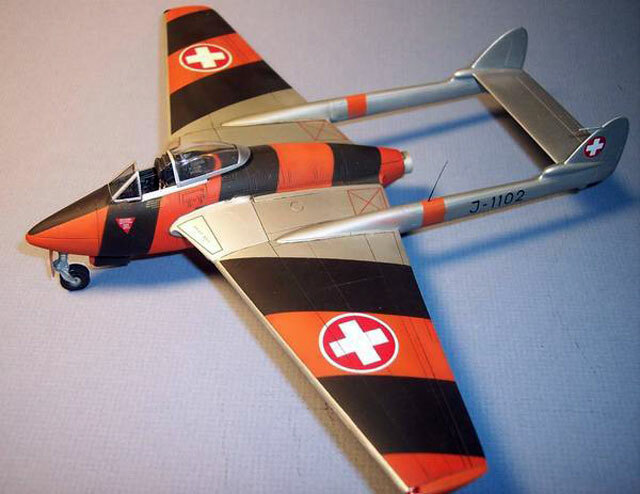 Here are some shots of my recently completed Classic Airframes 1/48 scale Vampire Export Version kit, finished in probably one of the most unique schemes I've seen. This build required me to replace the kit nose with the newer enlarged resin nose. 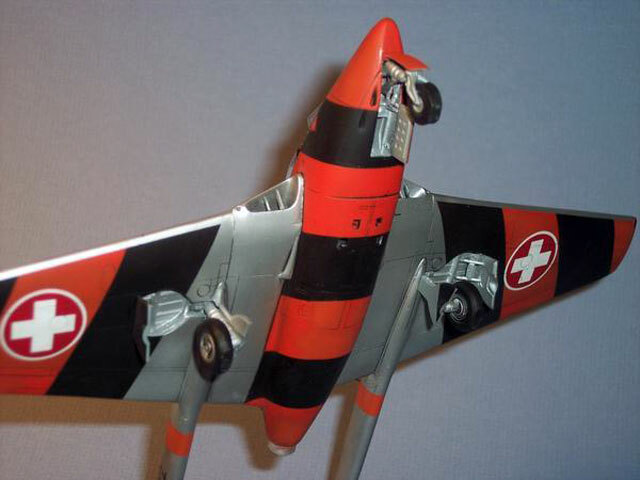 The kit includes in addition to the resin nose, a new resin cockpit and ejection seat to represent the changes the Swiss made to the plane over time. Replacing the nose was easy surgery that has the builder cutting along the angled kit panel line ahead of the windscreen. A little feathering in to flush the surfaces together with a flex file was all that was required to get a good fit. There is also included a new resin lower nose gear/gun shoots section included. The rest of the build goes the same as earlier examples of the kit. I wont bore you with those details. However I will tell you that I replaced the intake vanes with Evergreen flat stock cut to fit into each intake. I further replaced the pitot tube with a better molded one from my spares box. But believe me, the Dayglo Red fades to dull orange in time.